Paste prepared with Singaporean’s preference. This curry paste highlights the fragrance of cumin blended with other spices that gives out a strong yet not overwhelming taste. 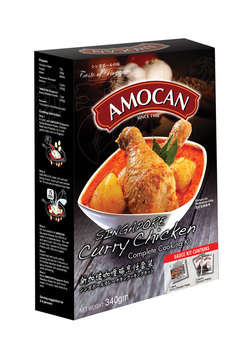 Equipped with curry paste, coconut milk powder and cooking instructions. Add in some chicken pieces, cut potatoes and you’re ready to go. 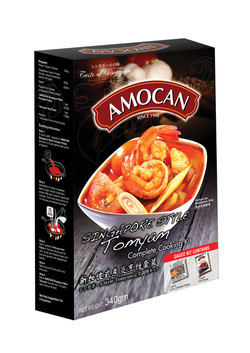 This Singaporean style Tomyam is robust in flavour yet not over- empowering. An aromatic blend of chilli, lemongrass and lime is sure to trigger your senses with its infamous spicy and sour combination. This aromatic blend of carefully selected spices, creamy coconut milk and ground shrimp makes your bowl of noodles extraordinary. The spiciness from the chilli is complemented by the creaminess of coconut milk laced with an undertone of blended spices and dried shrimp. Just add in your favourite noodles to get a hearty meal.